51 main events out of the Sachsenhausen Concentration Camp’s history are illuminated in the exhibition in the former prisoner’s kitchen. These events are used as examples in order to retrace the development of the camp. They are ordered into four themes – “Organisation and Construction of the Camp”, “Prisoner Society”, “Living Conditions in the Camp and Forced Labour”, “Violence, Terror and Death” – and provide a condensed chronology of the founding of the Sachsenhausen Concentration Camp in the Summer of 1936 up until the death marches and the liberation in April 1945. The presentation designed by the HG Merz Architekten und Museumsgestalter Firm (Stuttgart/Berlin) in the former prisoner kitchen, is the eleventh of a total of thirteen planned permanent exhibitions. It is also one of the most important restoration activities in the context of the decentralised museum concept for the redesign of the memorial site. The Berlin architect and building historian, Dr. Günter Hipfel, was responsible for the restoration of the building built in 1936/37, in line with regulations concerning historical monuments. 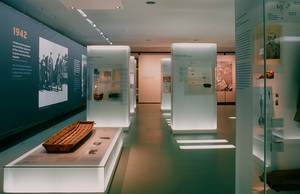 Numerous exhibits from the Sachsenhausen Concentration Camp are displayed, some of them in large format; for example, the original gallows, the death cart, the wooden horse used for beatings as well as furniture from the prisoner barracks. First, there are photos from the political prisoners’ section of the camp on display which a Norwegian prisoner was able to smuggle out of the camp. Among them is the photography of a so-called looter. At the end of the war, the SS brought people under this designation to the Sachsenhausen Concentration Camp; they were marked by black crosses on their faces. They were most likely foreign forced labourers, and at least several hundred of them were shot following the orders of the Gestapo. One of the most moving exhibits is the collection of carved figures and bullets which were buried in a mass grave along with the mortal remains of Jewish prisoners from the Lieberose satellite camp. During the evacuation of the camp in February 1945, the SS murdered over 1,300 Jews in a shooting spree which was carried out over a period of two days. The “physical pieces of evidence” have been expanded by the inclusion of numerous instructional media like graphs, maps and a large interactive model of the camp. Interactive media stations provide an overview of the development of the Sachsenhausen camp system as well as its satellite camps. Part of the museum is a theatre with about 50 seats where a film of just under 30 minutes is shown that links the events in the Sachsenhausen Concentration Camp to the general historical development in the time between 1933 and 1945. The film can be watch dubbed into one of four languages (German, English, French, Spanish). Moreover, there is a learning centre attached which has 14 computers where a variety of information opportunities about the history of the Sachsenhausen Concentration Camp are available. 63 years after the liberation, the Book of the Dead, including the names of about 20,500 people who died in the Sachsenhausen Concentration Camp, is open to the public in a closed and appropriately designed space, for the first time. The Book of the Dead is the result of many years of painstaking research. It is mainly based on the analysis of the remaining SS documents from the Sachsenhausen Concentration Camp commandant’s office. The design of the exhibition, conceived of by Prof. HG Merz’ architect firm, uses the existing room’s broad, open construction in order to spread the glass display cases out in a well-arranged, spaced-out manner. Key, historical photographs out of the history of the concentration camp, meant to have the effect of being photographic “icons” which stick in the visitor’s mind, are located along the sides of the room in large format on semi-transparent gauze surfaces. The row of window surfaces, which can also be seen in the exhibition space, as well as the exposed remains of a former steam vent in the prisoner kitchen’s ceiling, make it possible to experience the exhibition space’s original function. This is especially true when it comes to the historical cellar rooms that are now open to visitors for the first time. In the former potato peel cellar, there are impressive wall paintings from the time of the concentration camp as well as that of the Soviet Special Camp. Robert Ziebold’s life story is presented in an alcove where the remains of an urn with human ashes inside were found during construction. He was imprisoned in the Sachsenhausen Concentration Camp as a Jehovah’s Witness and was shot in 1940 on a direct order from Himmler. The lid of the urn with his name on it was discovered under the found remains. The history of the building is also presented in the cellar, including its usage during the time of the Soviet Special Camp and as a “camp museum” from 1961 on. The conversion of the decentralised exhibition concept of the Sachsenhausen Memorial Site is almost complete as of the opening of the “Prisoner Kitchen” museum. The conversion began in 1994 with the exhibition on the history of the Oranienburg Concentration Camp. A small exhibition about the commanding staff is being prepared; a presentation about the architecture and the organisation of the camp is the next step. The new museum “Prisoner’s Kitchen” has been accorded an especially important position within the decentralised design concept: It is located in the middle of the Memorial Site and therefore constitutes the epicentre of a network of museums. The museum doesn’t just provide a concise summary of the Sachsenhausen Concentration Camp’s history in connection to important service areas. It serves as the link for the decentralised concept, in that the exhibition consistently refers to other exhibitions’ subject matter, where events and topics which can only be briefly touched upon in the Prisoner’s Kitchen are presented in more detail.